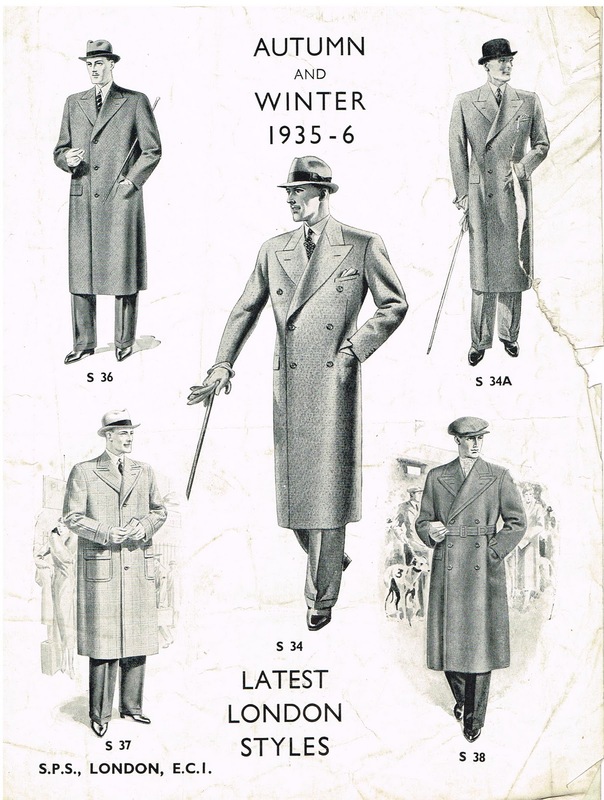 This extract from The Tailor & Cutter from 1935 should give some ample inspiration to those considering which of the winter coats to snap up in the sales after Christmas. An interesting point to note in the styling is the prevalence of peaked lapels even on single-breasted models – which was more common in the period, even on suits, than most of those fond of timeless rules would like to admit. Note also that all the outbreast pockets are decorated with a pocket handkerchief, on those coats that have them. The style in the bottom right is an interesting one, not often seen in fashion plates of the period. This is likely due to its relative informality, with both the double-breasted style and wide belt. Indeed, there is a progression of formality in the extract as a whole, beginning with this coat and passing to the SB opposite with its patch pockets, swelled seams and split sleeves. We then go to the SB in the top left, before finishing with the DBs in the centre and top right, which differ only in their button configuration. Those last two coats are also far more tailored than those around them – see how the line narrows below the waist. This is one of the pleasures of having a bespoke coat made. Ready-to-wear coats today usually lack shape because the manufacturer wants them to appeal to as broad an audience as possible. But a coat doesn’t have to be bespoke to flatter in this way – have that coat you buy in the January sales altered and the effect won’t be too dissimilar. You can follow the discussion on The Tailor & Cutter – overcoats by entering your email address in the box below. You will then receive an email every time a new comment is added. These will also contain a link to a page where you can stop the alerts, and remove all of your related data from the site. Late 1930s — In my opinion, the best period ever in men’s wear! Personally, I don’t think overcoats and topcoats get nearly the attention they deserve in today’s era. I think a classy overcoat or topcoat adds a wonderful finishing touch to a suit and tie. If this weather keeps up (a December daytime temp of 10 celcius in Northern Europe!) I’ll not be wearing an overcoat. I’ve already put it back into storage and I’m using a gabardine raincoat.